A pro-Tibetan protest in Toronto, Canada. 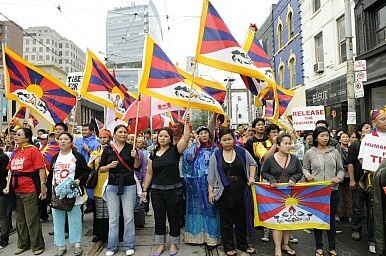 With emotions running high after the death of Tenzin Delek Rinpoche, Tibetan protestors rush into a Chinese consulate. On July 22, a group of pro-Tibetan protesters rushed in the compound of China’s consulate in Sydney, Australia, pulling down the Chinese flag and injuring one consular official. Around 50 protesters had gathered outside the consulate to protest the death of Tenzin Delek Rinpoche, a Tibetan Buddhist leader. Tenzin Delek was sentenced to death in 2002 after being convicted of bombings in Sichuan, but his sentence was later commuted to life in prison. Tenzin Delek and his advocates maintain that he is innocent and was imprisoned for political reasons. Tenzin Delek passed away on July 12, sparking criticism about his treatment while in prison. One cousin told the New York Times that the family believes Tenzin Delek was murdered. Adding insult to injury, authorities cremated his body against the wishes of his family – then Chinese police confiscated his ashes while they were being brought to the monk’s hometown for a funeral. The protest went awry, according to media reports, when the consulate opened its gates to allow a truck to pass through. Seizing the opportunity, some of the protestors rushed through the gate. A video of the incident from ABC shows over a dozen protesters holding Tibetan flags running through the gates of the consulate, while a handful of police try to catch them before they enter the compound. The protesters then gather as one man scales the flag pole and pulls down the Chinese flag. Tang Ying, the deputy consul general at the consulate in question, told Xinhua that protesters “tried to crash through the glass door of the main building and some of them pelted stones.” He said one consulate staffer had been injured while trying to stop the protesters. Eight of the protestors, including the person who climbed the flagpole, were arrested by Australian police on charges of trespassing. One woman was additionally charged with assault for allegedly injuring a consular official.